Advertisement space is available on pragwater.com. Revenue from ads helps us to maintain the website and to continue to provide up-to-date, high quality content. This website is not affiliated with the University of Puerto Rico. 1. Provide the requested information in the Form below. 2. After we receive your request, we will add your advertisement to the pragwater page you select (if space is available), and will then send you an email with a link to PayPal. 3. Within 24 hours, you should inspect your ad to make sure you are satisfied, and make your payment. In case you do not have a PayPal account, you can also pay with Visa, Master Card, American Express or Discover cards. 1. Only advertisements which are consistent with the themes discussed on pragwater.com will be accepted. Advertisements of a political or adult nature will not be accepted. Pragwater.com has the unconditional right to refuse to accept any material for publication or distribution without giving any reason. 2. 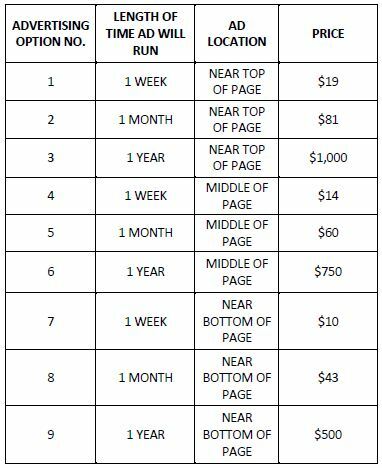 Other formatting and pricing options may be available if those in the above table do not meet your needs. If this is the case, please contact us at pragwater@gmail.com. 3. Refund policy: If an ad is terminated early, the refund will be pro-rated based on the number of days it was actually displayed. 4. Changes may be made to your ad during the contract period on a case by case basis. A legitimate case for changing the ad, for example, would be a spelling error in the ad. 5. Pragwater.com will monitor your ad on a daily basis. If you provided a URL to your image and the image changes periodically, we reserve the right to remove the ad (without refund) at any time if we believe that it violates any of the above policies. 6. Pragwater.com will never share or sell your personal or corporate information.